During the stay in Villa Cayo Naranjo you can use the services of the boat available to cross the bay twice a day from and to Bahia de Naranjo and once at night. 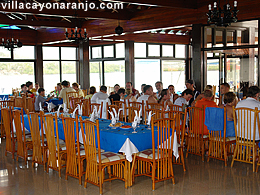 The cuban cuisine is present with exquisite dishes made with marine species, mainly seafood, at a restaurant close to the dolphinarium, also you can refresh with a nice tropical drink in bar “Morena Verde”. Trained dolphins show their abilities and share the sea with adventure lovers, amusing both children and adults with their dances, jumps and rapid movements. 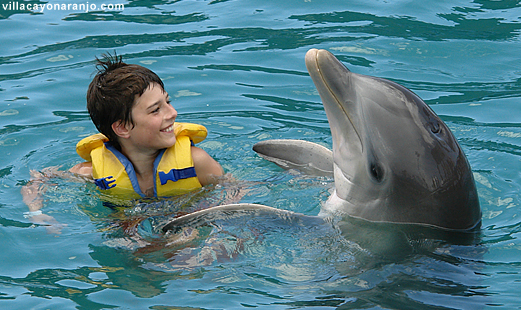 Visitors can get an unforgettable experience of swimming with dolphins. 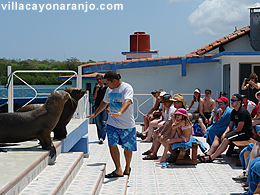 Sea lions share the show with dolphins and of course all visitors are able to takes their pictures of this magnificent show.